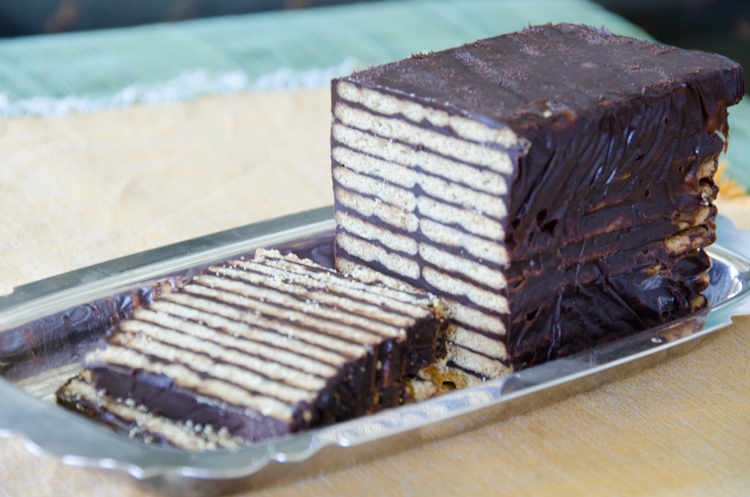 A kids’ favorite in Germany, Kalter Hund (cold dog) or Kalte Schnauze (cold snout) got its name because this bakeless cake with a rich chocolate filling was typically stored in the basement or in the refrigerator, and when brought into a warm room, condensation formed, just like on a dog’s nose. Another German name for it is Kellerkuchen (basement cake). In English is it sometimes called Hedgehog Slice. 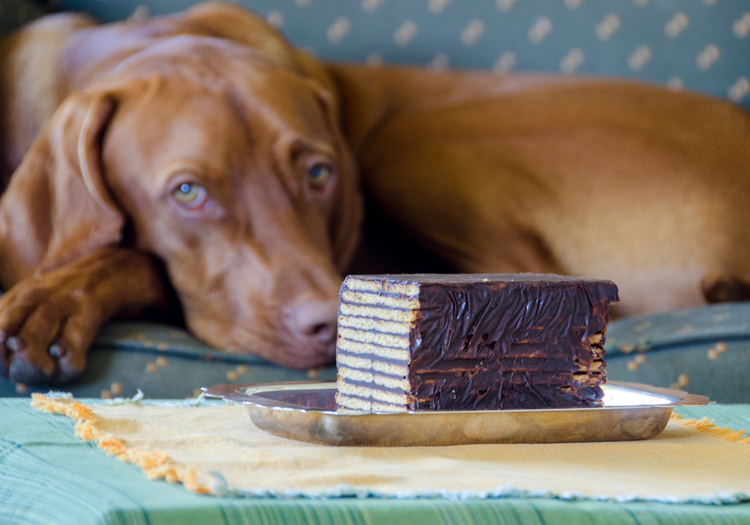 As I was nibbling on graham crackers the other day I thought that they would work well to make Kalter Hund, and that I have actually never made the cake. The only obstacle: in Germany the chocolate filling is usually made with palm fat, which is similar to vegetable shortening. And I do not like either one. I wondered whether I could use organic coconut oil instead. It worked! So here is my recipe for a miniature Kalter Hund, more of a puppy than an adult dog. Because the cake is so rich, I made it with about a quarter of the usual ingredients. As a mold I used an old 5½ x 3-inch (14 x 7 cm) plastic candy box, into which the graham crackers fit perfectly. A paper candy box of the same size will work just as well. If a miniature Kalter Hund is too small for you, feel free to quadruple the ingredients and use a loaf pan as a mold, which is the way it is done in Germany. And just in case you wonder – our dog did get a treat after posing for the photo. A carrot. Kalter Hund is for humans only! 1. Line the mold with cling wrap. 2. In a small saucepan, slowly warm the coconut oil and the cream over very low heat. Add the chocolate and stir until it is fully melted and smooth. 3. Remove the pan from the heat. After a few minutes, when the chocolate filling is still soft but not runny any longer, spread a thin layer into the mold. Place a graham cracker on top. Spread about 2 tablespoons of the filling over it and place another cracker on top. Proceed the same way with the rest of the crackers and the chocolate filling. 4. Gently straighten out the sides with a dinner knife. Place it in the freezer and check after a few minutes. Straighten out the sides again, they might shift a bit while the filling is still soft. Leave in the freezer until the filling is fully hardened. 5. Unmold onto a plate and refrigerate until serving. Cut the cake with a serrated knife. It will keep in the refrigerator for several days.